Happy February! 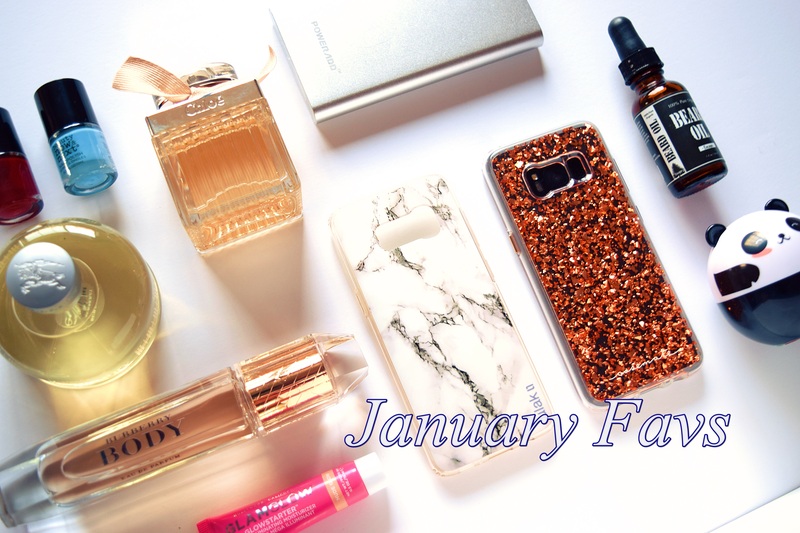 We are back with monthly favorites, more so, C’s January favorites! I am excited to share some of the things I have been using for a couple to a few months with you guys. So let’s get started! The best portable battery I have purchased so far. I have bought a couple in the past to only to become disappointed and ended up returning them. I bought this new baby on Amazon, Poweradd (same here) power bank with a 10,000 mah voltage. It is fast charging and I can get two full charges out of it and a partial charge on the third. It has a sleek aesthetic but the size and weight is not the most handbag friendly. It’s either that or a small crappy one that barely charges your phone for 30 minutes. So I am finally up to date when it comes to phones. I bought the Samsung Galaxy S8 and I love it! While I had to wait for my phone to come in the mail, I made sure I had a new phone case and a screen protector ahead of time, ready to use. I found this cute marble designed case by ULAK (same here). A perfect slim fit case that is chic and stylish. I haven’t dropped my phone yet so not sure how much protection it provides but I have faith in it. My nephew did knock the phone out of my hand and hit the kitchen floor. I checked the phone and it was perfect so far. Not only did I buy one but two cases! Karat rose-gold case by Case-Mate (same here) and I love the scattered gold flakes resembling confetti. It is a little thicker and bulkier than the marble case but I feel it provides more protection. I am using this case and next month I will be going back to the marble one. I saw this bottle sitting on the self. It said beard oil so of course, it was for men. But then I overheard a young woman talking about the same product and although it’s for men, she still used it on her face as a facial oil. I snatched that bottle up real quick and have used it ever since. So I have used the oil by Escape (same here) for several months and my skin reacts so well to it. You know the best thing about it? It’s 100% organic! I never used to be a perfume kind of gal. I was always into body sprays and mist. But I also don’t know when or how I transitioned to perfume. It just sort of happened. Don’t get me wrong, I still own a few body sprays that I can’t get over but perfume is my go-to accessory. I have three fragrances that I love to use on different occasions. Burberry Weekend (same here) is my everyday fragrance because it has a chic, casual scent to it. Burberry Body (same here) has a warm, soft scent with peachy notes and woody hints, which is why fell in love with this fragrance. It has nice packaging too. Lastly, the Chloe (same here) is hands down my favorite. I normally stay away from sweet and floral notes but there was just something about this scent that I couldn’t help but gravitate to it. It’s a unique and timeless scent. Chloe is alluring, has a romantic touch and a distinctive throw. Sephora gave me a little gift because it was my birthday month. What I received in the package was a supermud (I will talk further about on next favorites) and a glowstarter by GlamGlow (same here). If you have read my other monthly favorites posts, you know I love anything illuminating or highlighting. The glowstarter can be used under your makeup or worn without. I honestly apply it on over my makeup to add a bit of glow and dewiness to my skin. This 20 piece nail polish collection by Beauty now & next (similar here) was a Christmas gift from sister and nephew. I was so happy cause now I can explore different colors of polish without worrying if it will look on my hand and wasting money. This was another Christmas/birthday gift from a good friend of mines. A hand cream by Oh K! (same here) which is so cute because it comes in the shape of a panda and I love pandas as well. I didn’t start using yet because I am waiting for my other hand lotion to run out. So when that happens, I will be migrating to this baby. Well, there you have! My favorites for the month of January. Stay tuned to February’s favorites. I will be keeping it consistent this time. I promise! Thanks for reading and happy styling!